Gunners temporarily go top after Olivier Giroud and Laurent Koscielny score two in two minutes.The hosts scored twice in three first-half minutes, Giroud converting Mesut Ozil's cross before Laurent Koscielny doubled the hosts' advantage with another fine header. Two goals in two first half minutes see Arsenal go top of the table as they beat Everton 2-1.Arsenal made a slow start and endured a nervy finish here, but in between they turned on the style to reach the Premier League top for the first time since early 2014. 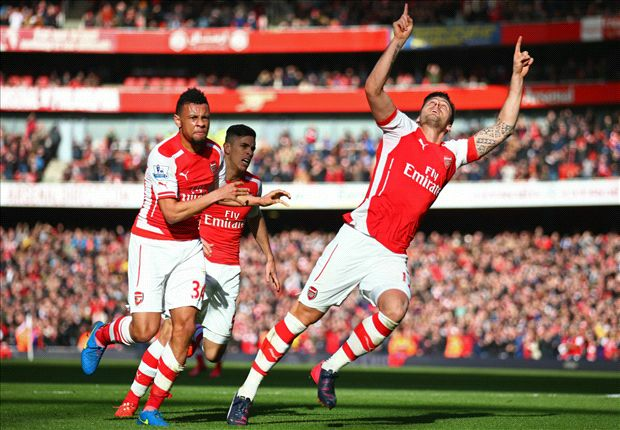 Arsenal hold on to pick up a hard-earned victory that sends them top of the Premier League table. They fully deserve all three points after putting in a great performance at both ends of the pitch, and they made Everton pay for a poor first-half display thanks to well-taken goals from Giroud and Koscielny. The visitors did well to get back into the game through a Barkley strike and looked better in the second period but still struggled going forward and can have few complaints about the scoreline.